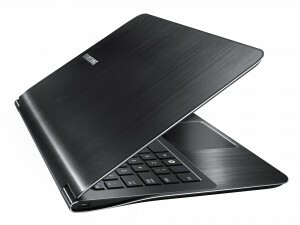 Samsung recently released a new version of its high-end Series 9 Ultrabook, this time with a little higher price tag. However, Samsung still seems unready to go toe to toe with Apple’s fancy Retina display style. The Retina display was Apple’s newest draw to consumers when it added the technology to the most recent versions of the MacBook and iPad. Samsung’s new version of the Series 9 replaces the previous 1,600 x 1,200 resolution display with a 13″ 1080p panel instead. In addition to that, this laptop comes with double the amount of solid state storage than the previous model with 256GB. The specs of the new Series 9 are pretty much the same as the previous model. Hardware consists of an Intel Core i7 processor, Intel HD 4000 graphics, 4GB of RAM, two USB ports (one of which is USB 3.0) and an SD card slot. Measurements for the laptop come in at 0.51″ thick with the entire device weighing in at 2.65 lbs. The real downside here is that this thin, light and high-resolution laptop comes at a pretty high price tag: $1,900. That is $500 more than Samsung’s current 13″ Series 9, which is priced at $1,400. The surprising thing here isn’t the price hike but more the fact that Samsung hasn’t included a display similar to Apple’s Retina. In fact, no other PC maker, including Samsung, has managed to put a display like the Retina into their laptops. The whole term “Retina” display was derived by Apple and refers to displays whose individual pixels are indistinguishable to the human eye when viewed at normal viewing angles and distances. The Chromebook Pixel is the only device on the market to come close to the display style since Apple released the MacBook Pro model with the Retina display last year. However, that doesn’t mean that companies are not considering it. At the IFA trade show in Berlin back in August, Samsung debuted a Series 9 prototype with a screen resolution of 2560 x 1440 pixels. The problem is that putting a screen like that in a device with the sleek design of the Series 9 raises battery life concerns and would increase the overall cost even more, which could explain why Samsung hasn’t gone further with that version of the Series 9. Maybe when Intel releases its Haswell processors things will change. These processors are said to add significant battery life improvements over the current Ivy Bridge chips, which would essentially solve one of the biggest concerns for Samsung and other companies. Source: PC World – Samsung refreshes Series 9 Ultrabook, but where’s the ‘Retina’ display?